Virtual Console 60 Port USB Flash Drive Duplicator | OhGizmo! It might not immediately seem clear why someone would need a device that’s capable of copying data to 60 flash drives at once. But just think of all the promotional flash drives you’ve been given over the years that feature PR material or demo software and you’ll get the idea. This particular model from Virtual Console features 60 ports with a maximum duplication speed of 5.6 MB per second per port. On average it can fill 60 512 MB flash drives in about 90 seconds, and it will probably take just as long to remove and attach 60 new flash drives once the copying process is complete. 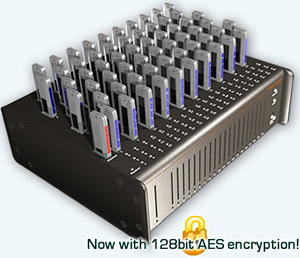 The duplicator itself connects to a PC via USB or ‘fast ethernet’ and also comes with the option of enabling AES 128bit encryption, though that feature is sold separately. But the convenience of the Virtual Console 60 Port Duplicator doesn’t come cheap. The device actually has a pretty hefty price tag of $7,999. I think what is it absolutely senseless thing to that will not use it house conditions practically such moment when she to be necessary. Im trying to line up favors for my wedding for the guests, and being the technodweeb that i am, it was decided personalized USB flash drives with photos on them would suffice. If something like this were cheaper (say less than $150) it would be cost effective for me. But seeing that preloading files costs only $1 per drive from promotional companies, $8K is a bit excessive for something i’d only use twice. I can’t at all fathom what the extra cost for encryption would get you. It’s copying data. If you want that data encrypted, why not just encrypt it before copying it? Just a superfluous feature to get naive IT departments to waste money, I guess. @Earthworm: Maybe their 21 port duplicator is more within your frugal budget. At a mere $4999, they’re practically giving them away. 60 x buslink 64 gb each = 3.84 Tera ultra-fast drive.. sweet eh.. hahaha! ‘fast ethernet’ is a real term, and probably doesn’t deserve ‘mocking quotes’. fast ethernet refers to the 100BaseT standard (100Mbps ethernet). You can easily build one of these for less then 300 bucks to gain 60 ports. Encryption software out there can be found for free (and stronger at that). It might not be as fast, but unless you mass produce your own USB drives, this isn't for you, and you likely have the equivalent built into the manufacturing line anyway. this thing, however, just kinda seems like a freak of nature, something you would find in an abandoned laboratory 20 years from now… after the zombie plague, of course.